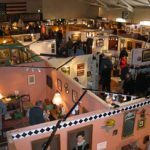 Since the early 1980s, the Maine Antiques Festival has been Maine’s largest antique exposition, and one of the larger antiques shows in New England. Antique dealers come from all over America and Canada to participate in the three-day event, which occurs on the second weekend of August. Items from the era of antiquities to the mid-20th century are available at this antique festival. View some one-of-a-kind antiques. Please share your Maine Antiques Festival reviews and comments.